Next year marks the 20th anniversary of South Africa’s Constitution. We have a chance of presenting a persuasive case to strengthen our Constitution, provided we are willing to do the hard work that is necessary to make the most of the opportunity of its anniversary. By RICHARD CALLAND. By happenstance, I found myself in Bosnia & Herzegovina on Saturday – the 20th anniversary of the Dayton Peace Agreement that brought an end to the Yugoslavian war of 1991-1995. And I discover that there are uncanny fragments of resemblance to South Africa’s own current predicaments. Even without Paris, the Dayton landmark would have got little or no international media attention. Twenty years ago, South Africa and the former Yugoslavia were “top five” international stories. Now, they barely get a look-in. Notwithstanding the notably heavy-duty military presence guarding the Sarajevo venue where Bosnia’s top government brass were gathered to mark the occasion on Saturday night, there was little sign that the wider population was celebrating Dayton. “It’s an artificial peace, that’s why”, noted one of the local teachers attending a workshop on post-conflict education at the United World College school in Mostar. “And it worries me greatly that so many of our young people don’t want to surface the underlying tensions between the different communities that we all know are there”, he added. South Africa has a similar problem – a disquieting, underlying sense that the 1994 settlement did not quite do the job – but, as I pointed out in response, the recent student protests suggest that there is an appetite amongst the so-called born free generation for confronting an array of unresolved issues, at least amongst those fortunate enough to be at university. Just as with the constitutional settlement of the mid-1990s in South Africa, so, too, the Dayton agreement was supposed not only to bring an end to conflict, but to reconcile ethnic division. Bosnia’s was even more intricate than South Africa’s in a sense, with three ethnic communities locked into an enduring peace accord; Serbs, Bosnian Muslims and Croats. Here Nelson Mandela played his part, but not everyone came to the party. Of course, it is unwise to stretch comparisons between societies so geographically and historically disparate, but one can argue that powerful elite groupings in both countries – wealthy whites and nationalist blacks in South Africa, nationalist Serbs in Bosnia – have picked away at the legitimacy of their respective settlements. In Bosnia, like South Africa, the stubborn constraints imposed by the structure of the economy have limited the employment opportunities for the young. As Guardian journalist Julian Borger pointed out in one of the few pieces that did reference the Dayton anniversary, Bosnia has one of the highest youth unemployment statistics in the world and “the anger and despair fuels yet more nationalism, in part because the system is rigged that way. It is a self-sustaining machine for producing misery”. Whereas complaints from nationalists in South Africa that the country’s constitutional settlement was a sell-out that has hampered “transformation” appear spurious and disingenuously opportunistic, the argument in Bosnia that Dayton locked the country into an unsustainable form of governance, with each of the three communities represented in every institution, leading to endemic paralysis in decision-making, seems far more credible. As with some ANC traditionalists, who hanker after the unity and sense of resolve, and common purpose of the anti-apartheid days, there are progressive people in Bosnia who hold a candle not for the dark days of the war, but to what preceded it: Tito’s Yugoslavia. Valentina Mindoljevic is the principal of the UWC school in Mostar. Now 45, she was a twenty-one year old student in Zagreb when war broke out in 1991. Soon she abandoned her studies and spent the next four years working in refugee camps where she faced “humanity at its best and worst”. Now, she cheerfully admits to a nostalgia for the united Yugoslavia of her teenage years. “Those were happy days”, she says, “when the country had a sense of community and common purpose, and when high culture and educational opportunity was a priority of the government”. She is aware of the danger of looking back in time through rose-tinted spectacles, but when the workshop delegation is shown around the Museum of Revolution in Sarajevo, a beautiful two-hour drive through the mountain valleys that were at times the killing fields of the frontline of the war in Bosnia, Mindoljevic does not disguise her delight as we enter the second part of the main exhibition – what can only be described as a generous portrayal of Tito’s Yugoslavia. The other section records the siege of Sarajevo, in all its ghastly detail, as well as the progress that the International Criminal Tribunal for the Former Yugoslavia (ICTFY) has made in prosecuting the perpetrators from all sides of the war. This is a testimony to the benefits of an international criminal justice regime, though local domestic, investigative authorities and courts have now been handed the responsibility of completing the pursuit of justice, with a number of outstanding investigations and trials still on-going, even after so many years have passed. Outside, as the first snow of the winter suddenly arrives, the scars of the war are still visible – the pot-holed buildings along the infamous “sniper’s alley” that runs like an arterial vein through the city, a constant reminder of the brutal conflict that took place in the South-East corner of Europe two decades ago. Andrew Watson, a Board member of the Mostar school, is leading the post-conflict education project that is providing teachers of the United World College movement that includes Waterford school in Swaziland, with an opportunity to think through the implications for teaching in divided societies with painful pasts. Watson believes that traditional forms of teaching “must be put aside in favour of an inter-disciplinary, critical-thinking approach that will enable teachers and students alike to navigate and embrace socio-economic complexity, with an emphasis on international mindedness and service learning”. He raises uncomfortable, but much-needed questions about whether the education system is fit for purpose. What of South Africa and its youth and, indeed, those of us who serve in educational institutions? Next year is a potentially critical one for the country for all sorts of reasons – amongst them the judicial review of the 2009 decision to drop charges against Jacob Zuma, the municipal elections and the ANC succession battle. It is also the 20 year anniversary of the final Constitution. It seems like yesterday, just as the Dayton agreement seems like a couple of years, not decades, ago for Mindoljevic. In South Africa the task is to bring the constitution to life for the generation that was not yet born in 1995. By all accounts, Bosnia’s youth care not a jot about Dayton, and may be willing to tear open the barely closed wounds of those painful, murderous years at the beginning of the 1990s. Will South Africa’s young lions, who so compellingly argued their case against a rise in university fees, do the same? Or can they be persuaded that not only is the Constitution a site of contestation that cannot be abandoned, but also one that has served the progressive, transformatory objectives of its founding fathers and mother, often powerfully protecting the interests of the country’s most vulnerable and poorest communities. Richard Calland is Associate Professor in Public Law at the University of Cape Town and a member of the Council for the Advancement of the South African Constitution (CASAC). 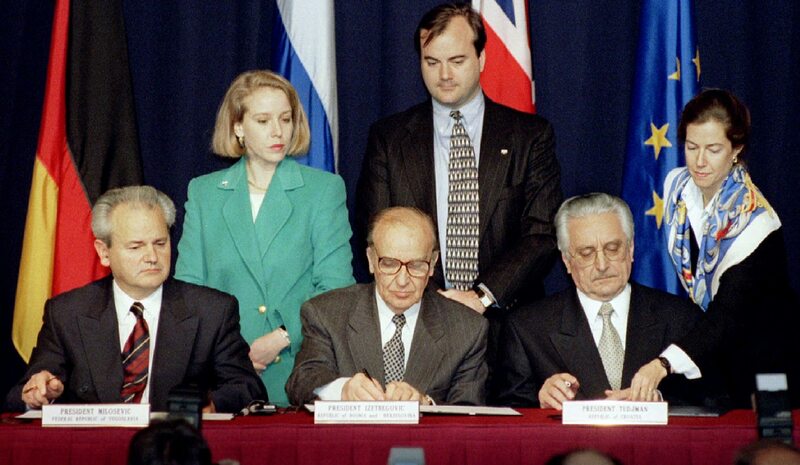 Photo: President Slobodan Milosevic of Serbia (L), President Alija Izetbegovic of Bosnia-Herzegovina (C) and President Franjo Tudjman of Croatia sign the Dayton Agreement peace accord at the Hope Hotel inside Wright-Patterson Air Force Base in this November 21, 1995 file photo. U.N. war crimes tribunal president Fausto Pocar said on March 12, 2006 a Dutch forensic team had not been able to determine the cause of death of Milosevic on Saturday which is why an autopsy was ordered. REUTERS/Eric Miller.